President Muhammadu Buhari has demonstrated his fitness to run for a second term by trekking 800 metres from the Eid praying ground in Daura to his private residence, the presidency has said. 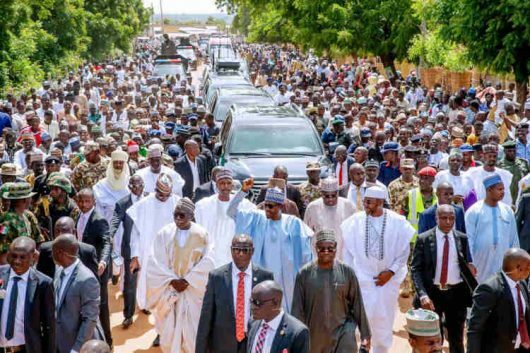 According to a statement made available to newsmen yesterday by his spokesman, Mallam Garba Shehu, Buhari after the Eid prayers shunned protocol and opted to trek some 800 metres, acknowledging cheers from Nigerians who lined up on his home route to catch a glimpse of him. A presidential aspirant and incumbent governor of Sokoto State, Aminu Tambuwal, had last week alleged that Buhari was “too old’’ to rule the country beyond 2019. Tambuwal stated this during a solidarity visit of students and youth in Sokoto, last week. “We love President Buhari and that was why we supported him in 2015 unconditionally, and while doing that, we are too sure that he will seek re-election after his first term. But when things are wrong, we have to tell him. “We still believe in his integrity, patriotism and courage, but these are not enough for a leader. “We all know that there is a vacuum in the government occasioned by his indisposition probably because of his old age or health condition. But Shehu stated the trekking by the president was a positive response to Tambuwal’s diatribe. “I think there are two things here. One is to say that the President is responsive to the enormous support and commitment of his own people that had come out in their numbers to see him and he just decided that he couldn’t go on riding in a black vehicle and he came out and walked to the distance. “I think the president has done one thing today – that the issue is not how old one is but how fit he is ; how healthy he is. Now that the president has proven his fitness and well-being to continue in office is a settled matter “I think that if people want to campaign against him they should do so on issues that are of significance to Nigerians. The President is fit, he is healthy; he is good to go for second term,’’ he said. Meanwhile the President yesterday donated a bull, 10 bags of rice and half-a-million Naira to some serving members of the National Youth Service Corps (NYSC) currently serving in his home state, Daura. He made the donations when they came to pay him homage as part of the Eid-El-Kabir festivities. Commenting on the scheme, he described it as one of the very laudable initiative of the former Military Head of State, Gen. Yakubu Gowon for which he had personally commended him in the past.